We’ve really FALL-en for these autumn-themed papers! For October, our free printable designs have been created with one of the most magical seasons in mind… You can almost hear the crunching of leaves and the scent of delicious hot chocolate in the air just looking at these papers. With beautiful oranges, pinks, and other autumnal tones, these are perfect for all of your seasonal crafts. Whether you’re looking for the perfect papers for your fall journal or planner, or if you’re simply a fan of everything that autumn brings, then these designs will really get you in the mood for pumpkin spice and all things nice and cosy. We’ve got six beautiful designs for you to download, including a wonderful sentiment sheet full of adorable elements that you can cut out and add to your cards or layouts. Simply click the link below to download your papers and print them off at home. Download your free Autumn papers here! 1. Cut six pieces of white Dovecraft cardstock to 6.5cm x 8.5cm. Using the pointed end of the We R Memory Keepers Punch Board, make three triangle banners, placing each piece under the plastic frame and using the tool to cut out the triangles. 2. Repeat with the opposite end of the board to make three rectangle banners. 3. Cover each piece with one of the free papers. 4. Use the hole punch in the We R Memory Keepers Punch Board to create a hole in each corner of your bunting pennants. 5. Thread the twine through, alternating the shapes. 6. Finish by adding a selection of autumnal-coloured Paper Flowers and Buttons. Why not use these papers to send a warm wish to your friends and family? We’ve layered a selection of the free papers together and topped them with a sentiment to create this super simple but super cute design! We’ve got a really easy make for you using our Free Papers that is sure to transform your gift giving! We spruced up a plain bag to create a cute gift bag with lots of beautiful detail that will really make any recipient smile. 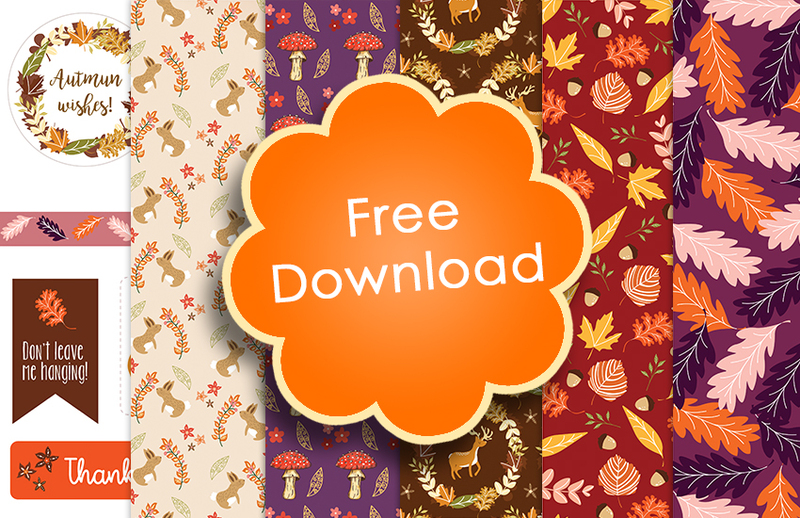 How will you use our free Autumn paper download? We’d love to see so don’t forget to #Trimcraft when uploading to social media and to share your makes in the Inspiration Area. Soooo beautiful, and thanks so much for the free papers this time too. I finally was able to download them here now, so exited to see them for real very soon now. Thanks again so much for all your great shares here always. Much apreciated, that´s for sure.